This Web site provides public access to search, view and print summary information on Unified Judicial System (UJS) purchase orders and contracts of $5000 or more, and detailed expenditure information. 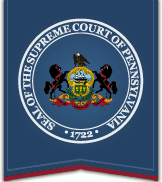 Also posted are reports of annual appropriation, personnel complement and annual compensation information for the Supreme, Superior and Commonwealth courts and Administrative Office of Pennsylvania Courts. If you need technical assistance with any of the following options, please send an e-mail to Rule509admin@pacourts.us.